This kit includes the required #1378SD Small Diameter Lug Nut Key for installation/removal. 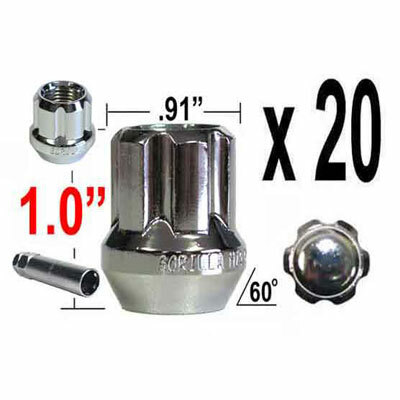 We also offer these items sold individually; Lug Nut (# 26008SD) and Gorilla Lug Nut Key (# 1378SD). If these are not the wheel locks for your vehicle, search all of our Wheel Locks here. Stringent quality control standards make the Gorilla Chrome Small Diameter Tuner lug nuts your best choice. You can match your factory lug nuts with a quality replacement of these Tuner lug nuts and quick replacement is a plus with any of our tuner nuts.